More artist in lineup will be added. Green Gathering Moment VOL-VI. [Part-II] Gathering of the tribe. 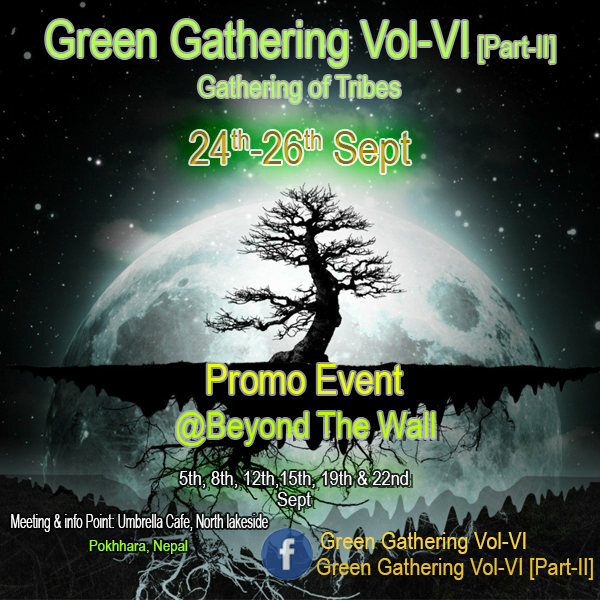 Be ready as Green Gathering family is on it's next step [PART-II] with the Mountains Roaring. During the gathering you can interact with the peoples, friends and artists as our aim is to get into One single consciousness on helping and healing with the high energy of the full moon by dancing and letting go and helping on conservation and protection of environment. Don't miss our Promo event at Beyond The Wall Bar Pokhara on 5th, 8th, 12th,15th, 19th and 22nd of Sept. starting from 05 Pm to 11 Pm with different artist from different genre. Genere from Folk, Psy Chill, Techno, Prog Psy Trance, Full on Psy, Prog Forest, Dark Forest to Hi-Tech Will be played. Pokhara, “The Lake City” a paradise in Nepal is situated on the lap of the majestic high mountains and the panoramic range of Himalayan peaks of the Annapurna that has been on the backpacker’s bucketlist list since the early sixties constantly, This Himalayan bound mystic nation is a dream destination for all kinds of travelers, boasting a rich heritage and colorful lively culture, snow capped peaks, spiritual history and vibrant people. More of the information available at Meeting and Ticket point. -Please bring your own tent and sleeping bags. First bus: 10 am-12 pm. Our gathering doesn't promotes any brand and is solely dependent upon donations and gatherers so with due respect we hope to see you with tickets as a return of gratitude for our hard work, passion and future.